1. 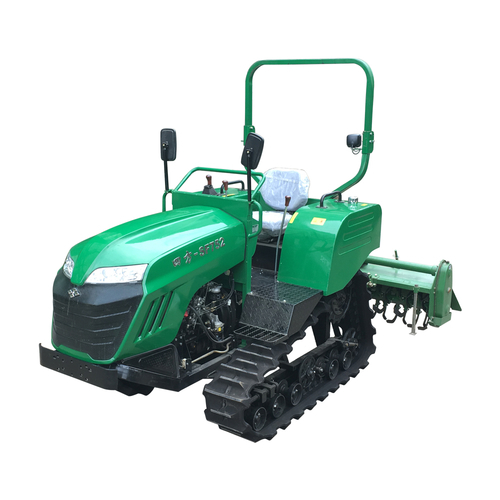 Sifang brand Crawler Tractor Model SF-752 and SF-502 is a farming machinery which is newly designed and developed tractor special for protective tilling in paddy field. It features compact structure and novel design. Its endless speed operation is realized with reliable hydraulic transmission technique. Their convenient steering and implement lifting can be simply operated with its only one control lever. 2. The ground clearance is increased with its triangular crawler driving system so that the tractor can pass easily from field to field against sinking and realize protective result for soil during cultivating the paddy field. 3. Many kinds of implements can be attached with the tri-points hydraulic hanging device to finish working of rotary tilling, plough, ridging, ditching, etc. easily and efficiently. Sifang brand Crawler Tractor Model SF-752 and SF-502 is a farming machinery which is newly designed and developed tractor special for protective tilling in paddy field. It features compact structure and novel design. Its endless speed operation is realized with reliable hydraulic transmission technique. Their convenient steering and implement lifting can be simply operated with its only one control lever.The ground clearance is increased with its triangular crawler driving system so that the tractor can pass easily from field to field against sinking and realize protective result for soil during cultivating the paddy field. Many kinds of implements can be attached with the tri-points hydraulic hanging device to finish working of rotary tilling, plough, ridging, ditching, etc. easily and efficiently.